Why are cats so insanely scared of cucumbers? I have spent many hours watching the entertaining antics of cats on you tube, the agility, focus and absolute speed of cat reflexes has always amazed me. Our athletic feline friends definitely have the perfect design for hunting and survival, that’s perhaps why at times they think they are doing you a favour when they saunter up to their food bowl to see what you have served. 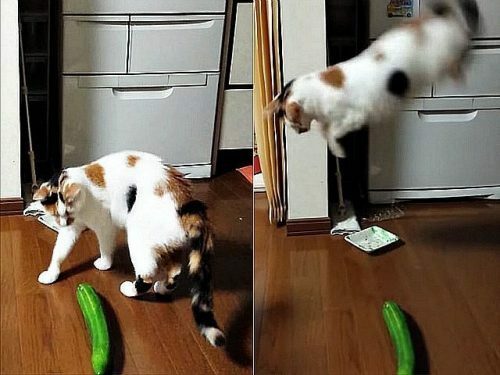 I’m sure you have seen those videos floating around where a human has snuck up on their cat and placed a cucumber behind them without them noticing and then waited in anticipation to see the cat’s reaction? These can be classed as funny videos but I am about to tell you why these cats react the way they do. As you know, cats are generally very aware of their surroundings even to the point that they are known to be ‘hyper-aware, and you may have noticed they’re usually very cautious around the ‘unknown’. So when a cucumber ‘creeps’ up on them they quickly assume that it is some sort of predator or snake like creature. How a domesticated cat knows what a snake looks like? It’s built into their natural instinct of course! Dr Roger Mugford, an animal behavioural specialist says “I think that the reaction is due to the novelty and unexpectedness of finding an unusual object secretly placed while their heads were down in the food bowl,” Cats wouldn’t normally find cucumbers lying on the floor, so the sheer novelty of the whole thing generally freaks them out. Although it can be a relatively funny trick to play on your cat and gauge its reaction, it is best not to try this at home. Veterinary professionals have exclaimed that not only does this cause unnecessary stress on your kitty; it can also be quite dangerous as your cat is unaware of its surroundings in its scared state and could potentially injure itself.